Though I’ve shared updates on my social networks, I’ve yet to follow up on my kidney donation! Everything went just as hoped, the surgery, the recipient’s transplant, and my recovery. I don’t have any information on the recipient at this time other than the kidney worked! I will be sharing my whole story here soon. 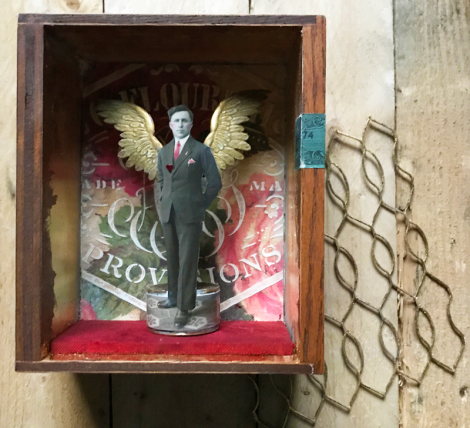 But, in the meantime, back to creating more assemblage art pieces! I’ve been working on several for the upcoming Americana Art Fest happening this May here in Petaluma. Each piece in the series is smaller in dimension to most of my past assemblage pieces and I’m kind of liking this new scale. I’ll be sharing those in upcoming blog posts so be sure to stay tuned! Additionally, I just finished a piece for another upcoming local event- FOILED! A St Valentine’s Day Group Art Show. 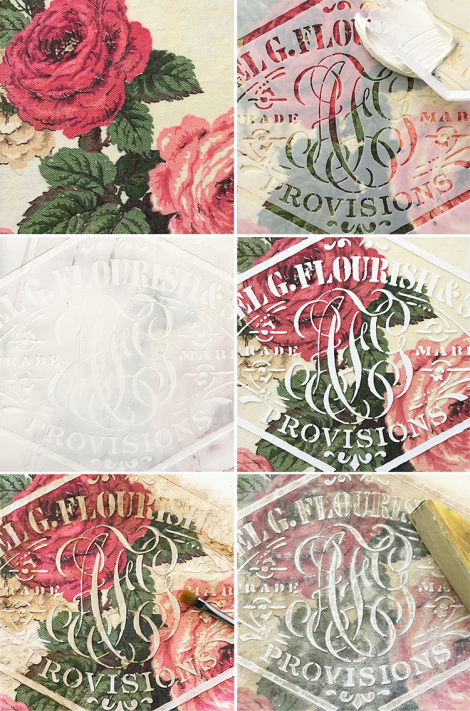 I laminated vintage floral fabric to mat board with YES! paste. I finished by sanding the hardened, raised stenciled area and brushed away excess dust. The finished background was trimmed to fit into the back of the box and adhered with Goop. The box chosen for this piece was once a small cabinet drawer as found with handle removed. 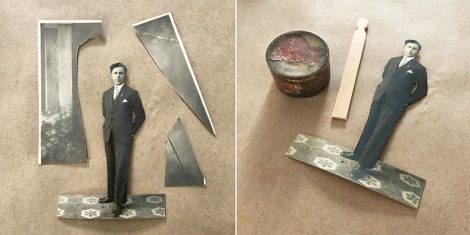 As a platform base for the figure I covered a small piece of wood with red velvet pulled from the cover of an antique photo album that was beyond repair. 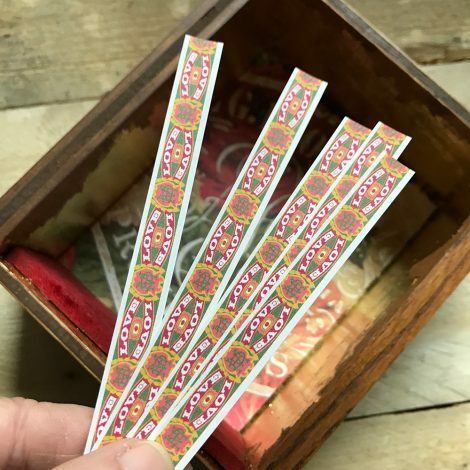 For many of my assemblage pieces I design, print and trim out faux cigar box edging strips to finish off the edges of boxes, adhering with matte gel medium, to add relevant text to my art. 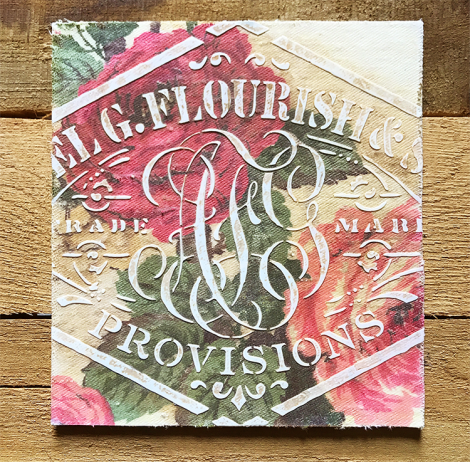 For the focal point I harvested a vintage photo postcard from my stash. Although I could’ve scanned and copied the image to cardstock, I wanted to retain the excellent detail of the photo and chose to use the actual original. 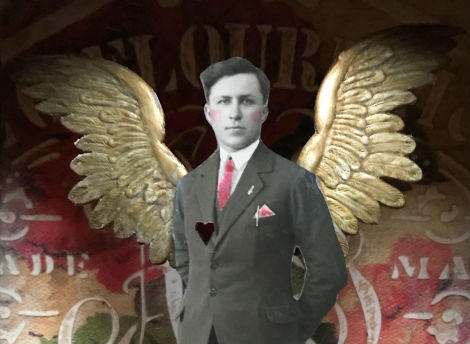 I attached the base of the photo around an old brass snuff tin and stabilized the figure from the back with a modified popsicle stick. I found some vintage metal screening out in our old chicken coop and covered it and the interior sides of the wooden box with gold leaf. 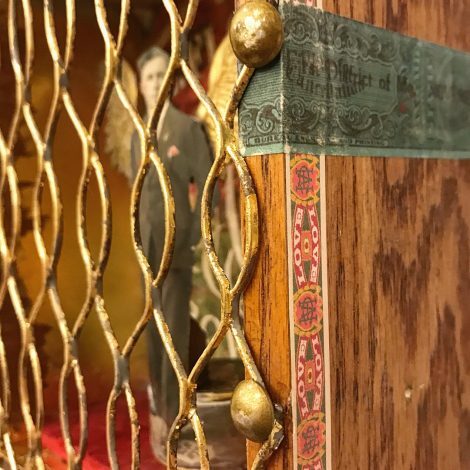 The brass base of the figure was secured by a screw through holes drilled into the base of the box and velvet covered wood platform. Much of the interior was finished off with additional white paste spread into the cracks and grooves to patina. The screen was attached with vintage brass upholstery tacks and hanging hardware added to the back. 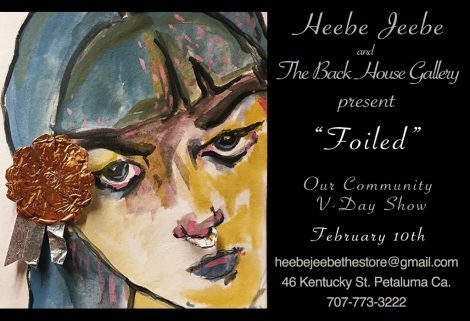 If you’re in Sonoma County February 10, 2018 through the first week of March I hope you’ll visit Petaluma’s ever-popular Heebe Jeebe store for crazy-cool goods and The Backhouse Gallery for more foiled art! 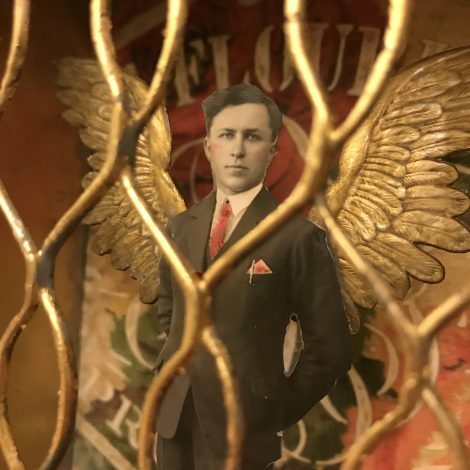 This entry was posted in assemblage, collage, mixed media, repurposing, stencil, stencils, Uncategorized and tagged assemblage art, Gold Leaf, Heebe Jeebe Petaluma, Stencils, The Backhouse Gallery. Bookmark the permalink. Cages come in so many forms, don’t they? Gilded and otherwise, some we see and some we don’t. I’m glad to hear that the transplant went well and you’re on your way to recovery. Oh, yes, I’ll be going to see the Foiled Art exhibit at Heebe Jeebe’s! Your piece is VERY cool! Oh Cathe!! I am thrilled to hear the good news about your surgery and your speedy and full recovery! I look forward to the rest of your story! 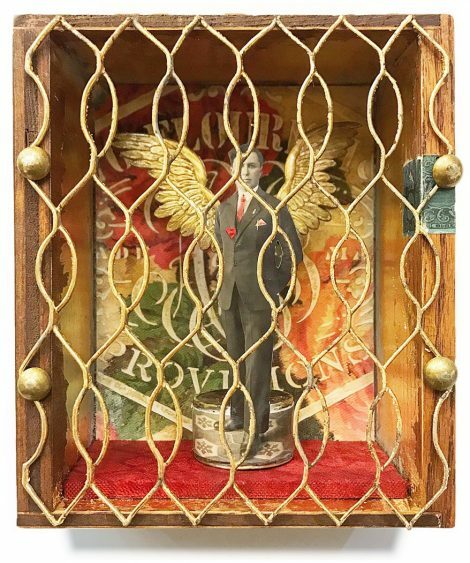 WOW Thank you so very much for the step outs here on this gilded cage piece- it is fabulous!!! Best of luck with your Heebee Jeebee Show! Love this!! Glad the transplant has gone well for all👍Such good news! So happy you are well. I love the way your project turned out. What a beautiful piece. So inspiring! Stay well and keep creating! you are an amazing and gifted friend.. so happy you are doing great.. love the caged assemblage above.. didn’t expect you to share the fixings’..
hope to see you again soon.. sending much love and hugs.. Excellent project. Love this piece. I have a couple of wooden cigar boxes and you have now inspired me to try and do a “shadow box” from one of them. I have the original paper doll and I so want the new one as well as the winter one. Welcome back and have a lovely weekend. I love your art. This piece is really wonderful. I especially like the photo withaddedwings and the caged effect! Super! Wonderful to hear about your successful transplant and recovery! Lovely project! I’m a new subscriber so I didn’t know about the transplant. Wow! What a gift you gave. Thank you for posting the steps for the assemblage. It is fantastic. A gift to all of us. You are such an inspiration to me, Cathe! Your kidney donation is just one example. This new artpiece is another. Is that custom stencil something available to purchase? Please advise.